August 17, 1920. A leather-bound projectile with a cork core speeds towards a batter. There is nothing extraordinary about the object, or indeed the action of the man who releases it. But a sport is about to change forever. This is not cricket but baseball, which was more akin to our sport in 1920 than today, in at least one respect: one ball was used throughout a game. It was common practice to scuff that ball, spit on it, and discolour it, helping it move in the air and become hard to spot at high speed. The older and softer the ball got, the harder it was to hit, and low scores characterised the era for this and other reasons. That one pitch on August 17 changed that. Ray Chapman of the Cleveland Indians was at the plate, and the ball hit his head. Chapman died 12 hours later. The next season, Major League Baseball (MLB) changed its rules, mandating that a ball be replaced at the slightest sign of wear. It brought to a close what is referred to as the sport's "dead-ball era", named as much for its low-scoring trend as the bloody incident that brought about its end. Cricket balls are an odd fit in modern sport. In nearly every other sport, the ball is replaced without a second look when it goes out of play. But the cricket ball, first pristine and then required to deteriorate in a certain way, is perhaps cricket's most unique element. Consider the recent series between India and England. A central character was the swinging ball, around which both sides constructed their narratives. It made for absorbing cricket, with records like ten wickets in a session accompanying some innings of substance. Pundits, purists, and some regular fans wondered why we don't see the ball swing as much in all Test matches. On the other hand, men's limited-overs cricket is stepping away from that position, like a dueller taking large and deliberate steps away from - yet towards - possible death. Today, the white ball is less a character in the game and more a prop. The 2011 rule stipulating that two new balls be used in every ODI innings (not for the first time) was intended to improve visibility and extend the potency of the white ball. But it has practically killed reverse swing, dented the fortunes of fingerspinners, and in collusion with flat pitches, blunted both seam movement and spin. In the last few months, some weighty voices have decried the two-new-balls rule. Dale Steyn, Mike Atherton, even Sachin Tendulkar, whose Twitter feed is usually more sterile than a bottle of disinfectant. To understand why, we need to look closely at the object of contention. In Tests, the specimens vary depending on where on the map we are. In limited-overs cricket though, a certain Australian bird has made the entire cricketing world its habitat. The Thompson family, owners of the Kookaburra cricket equipment brand, could give masterclasses on how to maximise first-mover advantage. 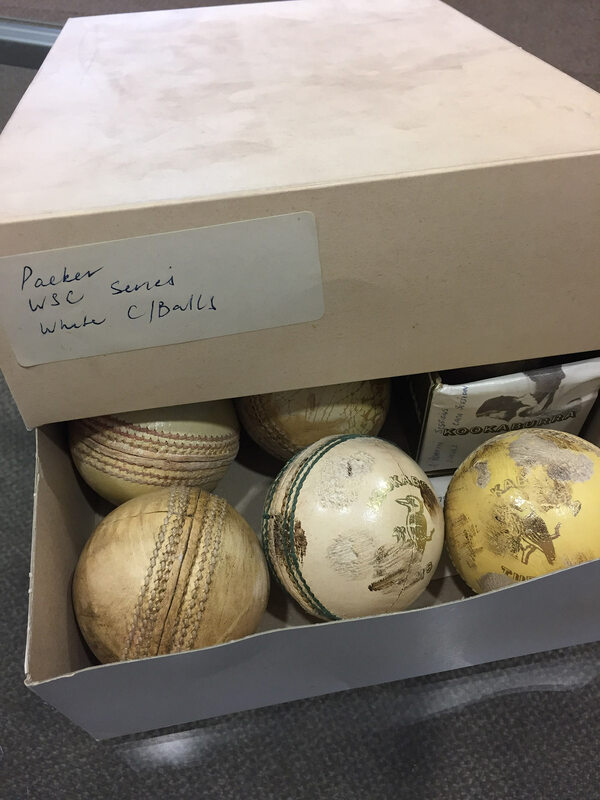 When the English balls that were used in Test matches in Australia - mostly Wisden Special Crowns - fell out of favour after the second World War, Kookaburra won the Australian Cricket Board's contract. 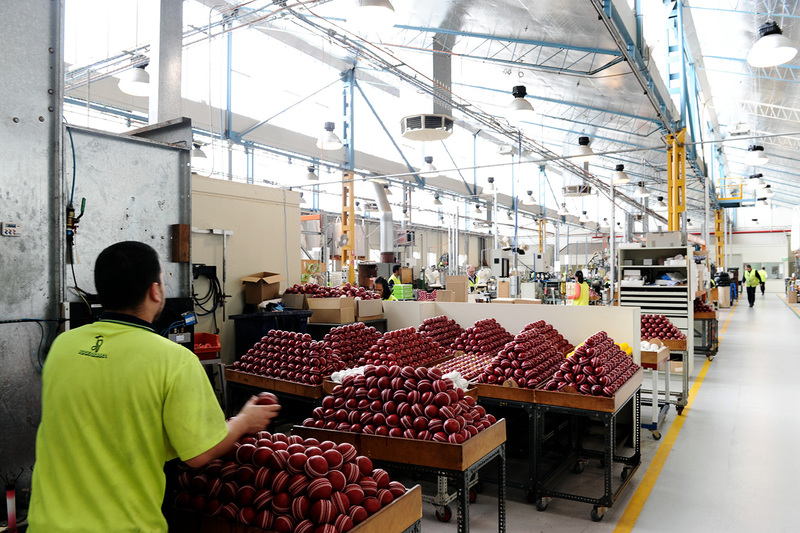 Today they are the biggest manufacturer of cricket balls in the world. In Test matches, their hegemony prevails everywhere but India, where the SG ball is used, and England and the West Indies, where the Dukes ball is. If Kookaburra's red-ball market share is impressive, their white-ball dominance is total. Not surprising, since they invented the white ball. Like much of the modern limited-overs game, the origin of the white ball is rooted in World Series Cricket (WSC). In 1977, WSC asked Kookaburra to make a ball that would be visible under lights. Kookaburra had experience of white balls from another sport. "The 1956 Olympics were in Melbourne and Kookaburra hockey balls were used," says Shannon Gill, Kookaburra spokesperson. Those were effectively cricket balls painted white. Austin Robertson and Richie Benaud from WSC went back and forth with Bruce Thompson from Kookaburra during the trials, which lasted two years. Experiments started with orange, yellow and white balls. White proved the most visible. Even so, during WSC games, says Gill, the umpires would sometimes "wipe the ball, and even bleach was used at one stage" to keep the ball bright. Interestingly, Kookaburra faced no backlash from the ACB for their involvement with WSC, partly because of a lack of a strong competitor, and partly because the two were bedfellows at lower levels of cricket. In fact, after WSC, ODIs in Australia became coloured-clothing, white-ball affairs and Kookaburra's reach spread further, soon enough into New Zealand. In 1992, Kookaburra white balls were used for the first time in a World Cup, hosted by Australia and New Zealand. That tournament is remembered for many reasons, but not usually for being the first - and, until 2015, only - World Cup to feature two new balls in an innings. The following World Cup, in the subcontinent in 1996, also used the Kookaburra white ball. Establishing itself as a World Cup ball was a significant step for Kookaburra. Dukes red balls have been around since 1760, and they were used in the first three World Cups, staged in England, as well as the fourth, in India and Pakistan in 1987. 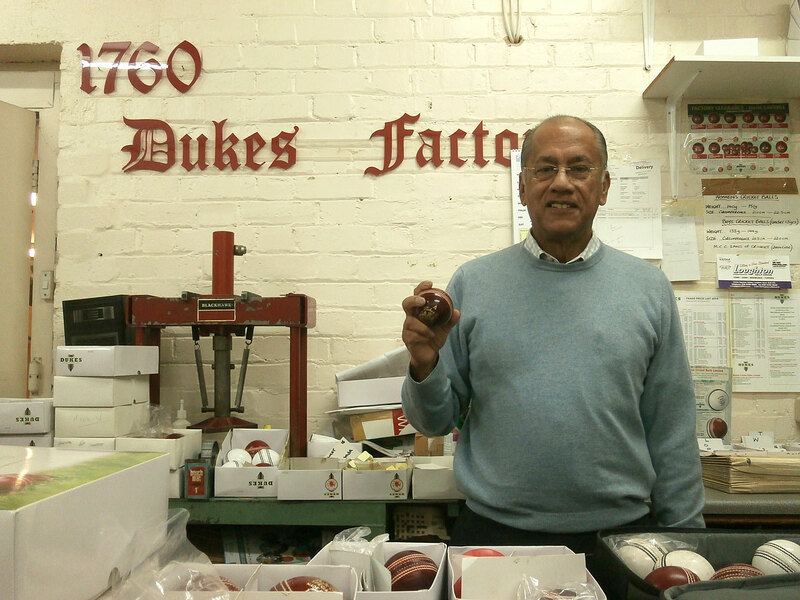 That was the year Dilip Jajodia acquired the Dukes brand, when he bought British Cricket Balls Ltd from Gray-Nicolls. Dukes too looked to tap into the white-ball market. The 1999 World Cup in England was the first - and so far only - one to use the white Dukes ball. With its prouder seam, the ball swung appreciably in helpful conditions. That tournament has the highest wides-per-match figure of any World Cup for which data is available (1996 onwards): 20.05. The next highest is 13.94 in 2015. Meanwhile in India, Sanspareils Greenlands, who had begun manufacturing cricket balls in 1951, debuted their SG Test ball in Tests in 1991. By the mid-1990s, SG were making white balls too. "White Kookaburra Turf cricket balls supplied by the ICC will be used for all matches." This is what it says in the playing conditions for ICC tournaments, suggesting that the ICC's official ball is the white Kookaburra Turf. After all, playing conditions for every men's World Cup the ICC has independently organised, starting with 2003 right up to 2015, have recommended the white Kookaburra, and it is the ball that will be used in the 2019 World Cup in England. Following that lead, the white Kookaburra is used in bilateral ODIs all over the world. Since it is used in bilateral cricket, it is used in domestic cricket, including T20 leagues, across the globe. All this makes perfect sense; players should be familiar with "the World Cup ball". Except, it is not as clear-cut as that. The ICC says it has no contract with Kookaburra as the official supplier of cricket balls. The ICC playing conditions for ODI cricket, outside of World Cups, state: "The Home Board shall provide white cricket balls of an approved standard for ODI cricket." For bilateral cricket, boards can use whichever ball they want. "The ICC's philosophy has been that we will use the balls that have been tried in the conditions in which the event is being played," says Geoff Allardice, the ICC's General Manager of Cricket. "So the Kookaburra Turf was used in the 2003 World Cup because that was the ball that was used for limited-overs cricket in South Africa." In order to prepare their teams for that tournament, member boards around the world use the same ball in bilateral ODIs. "So it is a bit of a Catch-22," adds Allardice, "in that we will use the balls that the host country normally uses for our events, but the members are using the balls that the ICC will be using in the upcoming tournament, in their home ODIs." Kookaburra developed a strong presence in most leading Test nations, and their balls were used for Under-19 World Cups in Sri Lanka and New Zealand in the early 2000s. By the 2003 World Cup, the perception that Kookaburra was the official ball for World Cups had solidified. An ECB media official confirmed that they switched to the Kookaburra for home internationals "ensuring we use the same balls as in the ICC global events". Several players, media persons and administrators interviewed for this article believed that Kookaburra was the official ICC ball. Looking back, it seems that Kookaburra cornered the limited-overs market on the back of something as intangible as self-fulfilling prophecy. Cricket balls have six rows of stitching along their seam, three rows on each hemisphere. With the Dukes and SG, all six rows are stitched by hand, and all six go across the hemispheres, the way you thread your shoelaces through eyelets on both sides of the shoe's tongue. This is why the seam of the Dukes and SG balls feel prouder, and stays that way for longer. Dukes ship their half-finished balls to the subcontinent, where labour costs are thin and skill is thick. Craftsmen aim to put exactly 80 stitches into each seam. 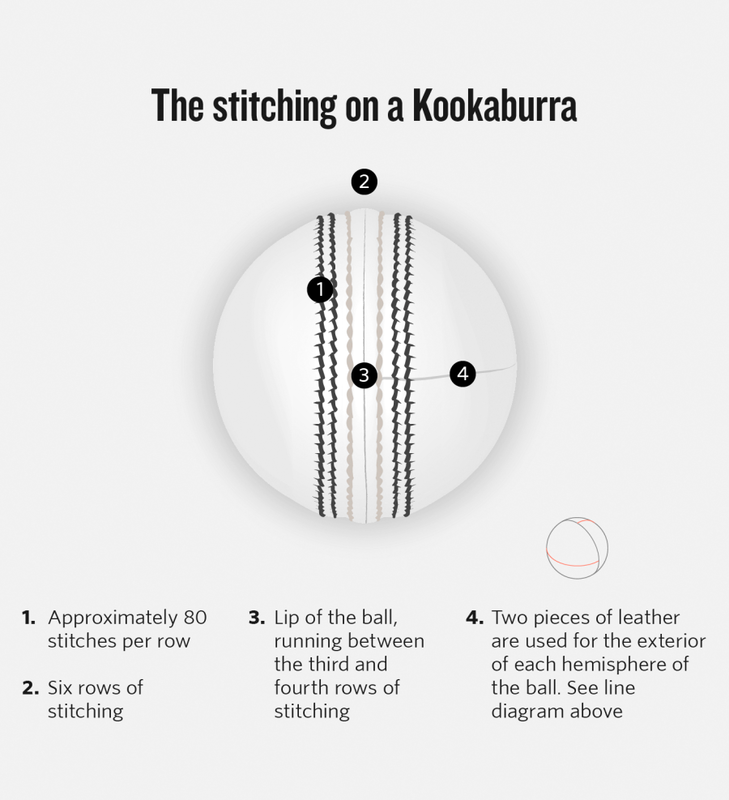 In Kookaburra balls, only the middle two rows are stitched across hemispheres by hand, sealing what is called the lip of the ball. The outer four rows are stitched into their own hemisphere by machine (imagine your shoelaces going through the eyelets of only one side). This is why the seam of the Kookaburra flattens out faster. Then there are subtle differences in the leather, depending on where it is sourced from. Leather, in its natural colour after tanning, is close to white. 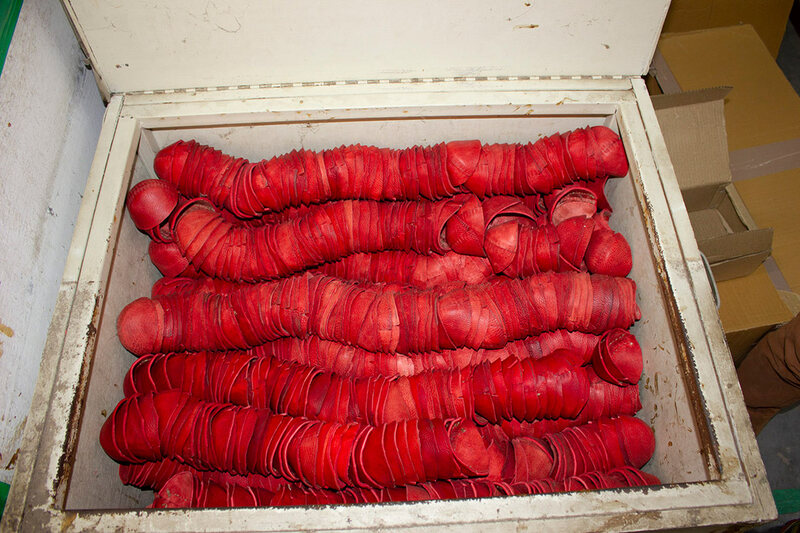 While red cricket balls are usually dyed at a tannery before being sent to ball manufacturers, white balls are not. "In very simplistic terms, the property of the colour [white] is not strong enough to transfer on any material, especially on leather," says Paras Anand, the third-generation scion of the family-owned SG. A luminescent white pigment is sprayed on the ball during finishing. There are also critical differences in the philosophies of the three companies. 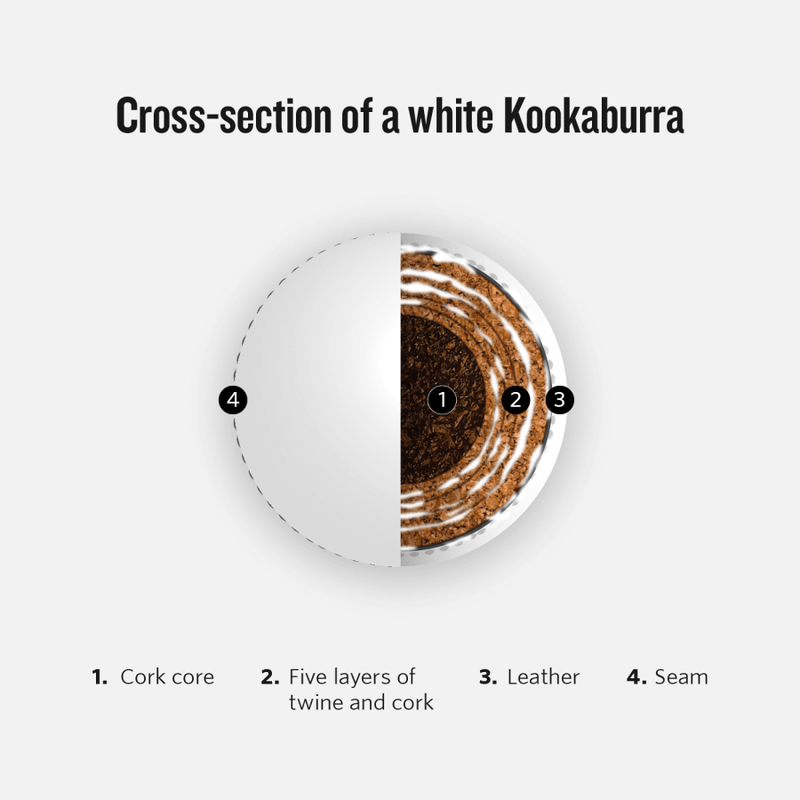 Kookaburra's more automated processes allowed them to keep up with growing demand in the '80s and '90s, and helped standardise their product. Kookaburra balls used across the world are exactly the same. Dukes, however, make bespoke balls for different regions. The Dukes ball used in England is greased to make it waterproof. But since that process softens the leather, the ball made for the abrasive pitches of the Caribbean has a urethane polish instead. SG, on the other hand, have an India-centred approach, catering to the country's vast domestic market. The brands have their share of supporters and detractors. The Kookaburra's consistency has led to it being widely accepted around the world, despite its limitations. Some players, like former England international Samit Patel, enjoy the Kookaburra because its seam is wider than the Dukes, giving a spinner more surface area to land the ball on. "I think the Kookaburra brings the best out in the game rather than the Dukes," says Patel. "We should have a cricket ball that everybody plays around the world with." Not all players agree. 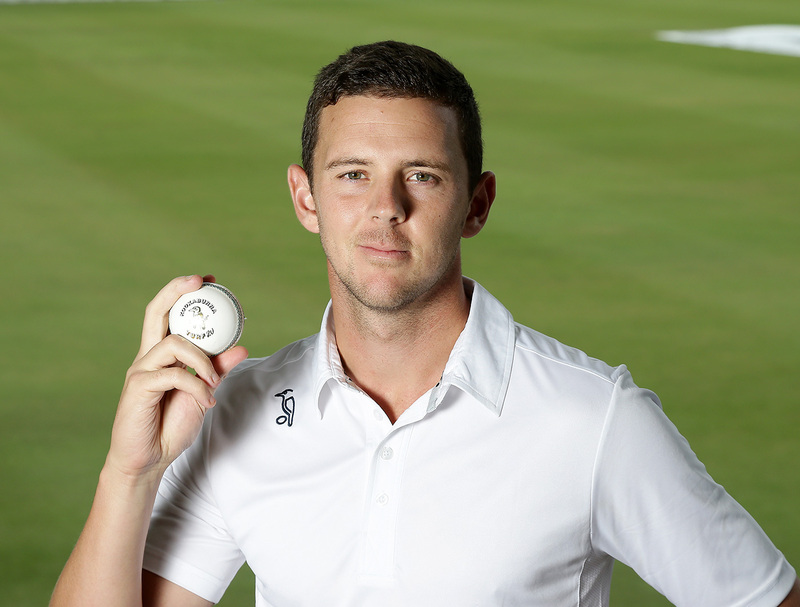 Australia's Peter Siddle says: "Balls are made to suit the conditions of the country. It will be so hard to make one ball to work in every single country." There was a notable defection from the Kookaburra stable in 2011, when West Indies moved to the Dukes red for Tests. It was at the behest of incoming coach OttisGibson, who was well acquainted with the Dukes from his county days. "I felt it was more effective in the Caribbean conditions," Gibson says. "It offered more assistance upfront and didn't get as old and scuffed up as quickly as the Kookaburra." In ODI cricket, though, entropy has increased with every World Cup cycle. The ICC introduced the two-new-balls rule in 2011 to regularise the use of two balls in a match: white Kookaburra balls got discoloured over the course of 50 overs, and were routinely being changed at the umpires' discretion. From 2007, that change was made mandatory, after the 34th over. Both these systems were prone to inconsistency and exploitation. Batsmen sometimes claimed they couldn't see the ball if they noticed it had started reversing. If a replacement aided reverse swing, bowlers became more threatening in the death overs. But on most occasions, the changed ball simply came on to the bat better. The two-new-balls rule came in to remove this inconsistency and solve problems of visibility. But it has left many unhappy, not least Kookaburra's competition. When the ICC Cricket Committee changed the rule, Dukes - who claim their white ball available at the time could last 50 overs without getting so discoloured that it needed replacement - did not get a look in. It meant that almost overnight, Kookaburra's business from ODIs doubled, as did the ball costs for ODIs for each cricket board. 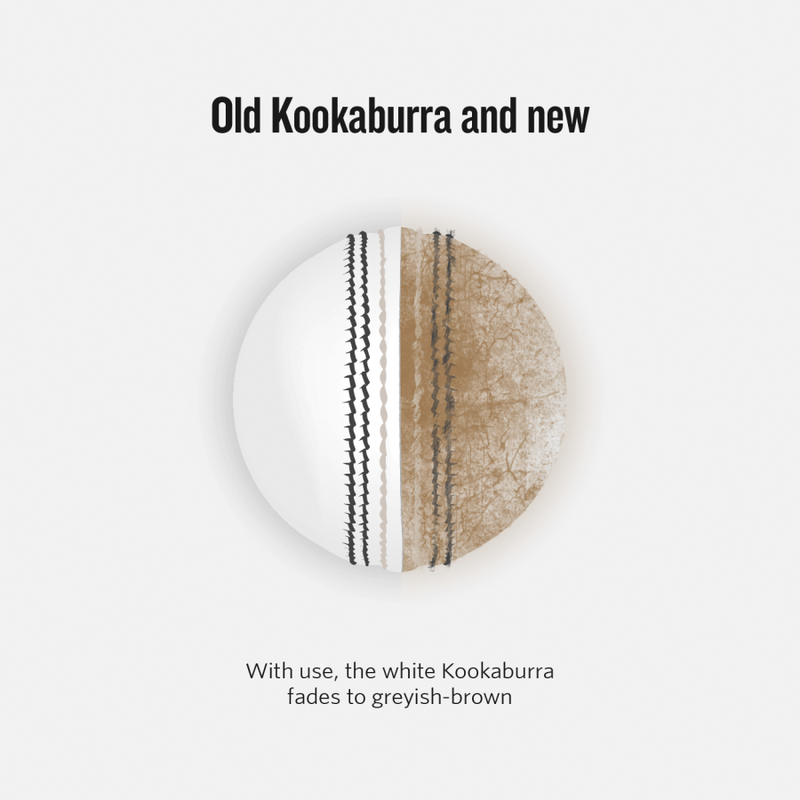 These are considerable: no manufacturer revealed actual prices, but each Kookaburra Turf ball is believed to cost A$120-180 (US$87-131), depending on the quantity bought. SG Test balls cost around Rs 1800 ($26) each, and a Dukes Special County balls costs around £50 ($65). From the ICC's perspective, the two-new-balls rule has proved to be a success. It has solved the problem of discoloration and visibility, ensured that both teams use balls that stay in similar condition, and encouraged run-fests. High run rates in the 2011-2015 World Cup cycle were attributed to the draconian fielding restrictions of that period. But even with one extra fielder outside the circle and no batting Powerplay, totals of 300 have been crossed 142 times, 14 more than the figure for the last cycle, with eight months still to go. The lack of reverse swing has neutered the yorker. And while we hail the rise of wristspinners, we forget the fingerspinner, who has been laid by the wayside. Flat pitches and fitter, more aggressive batsmen have also played major roles in these trends. For many, the ICC's two-new-balls rule is like the update you thought would make your phone better, only to leave you wishing for your old OS. "They brought in the two new balls so that there would be a bit more in it for the bowlers, but it's worked out as being better for batters - the balls just stay harder and they don't swing or seam," says Australia and Victoria bowler Scott Boland. "I think that if they wanted to keep the wickets as flat, there has to be a bit of deterioration in the ball, so the balls can reverse." Says former Australia fast bowler and Sussex coach Jason Gillespie: "They've got the ball used at each end in 50-over cricket because the quality of the Kookaburra is such that they can't get it to last 50 overs. For administrators and lawmakers to have to change the laws of the game because of the inadequacy of the ball is unacceptable." Two slips, a gully, and about 3000 Afghan fans wait for an edge. It is July 2017, Afghanistan's debut at Lord's, in a 50-over game against the MCC. Shapoor Zadran begins proceedings with a maiden. The fielders pass the ball to Dawlat Zadran for the second over. Two Zadrans - just one ball. Between overs, it is perused, polished, but not pocketed by the umpire. It is a white Dukes, not a Kookaburra. In 2015, the ICC said it would partner with the MCC to research improvements to the cricket ball. Two years on, the club played two 50-overs matches, against Scotland and Afghanistan, with a single white Dukes - the same kind that Jajodia insists has been around for 20 years. In the game against Afghanistan, the ball's colour held up well even on a used, sixth-day pitch. "There was a bit of tail in towards the end, and a little pace to go with it," says Patel, who played for the MCC. In the other game, Scotland's Safyaan Sharif picked up three wickets. "The ball did get tired really quickly," says Sharif. "In the first ten overs, we managed to get a bit of reverse, which was strange." He also remembers the ball being hard to pick at the end of the innings. The cricket-ball market moves like an iceberg: unbearably slow, but occasionally a big chunk splinters and the landscape changes. In 2016, Jajodia found a foothold in Kookaburra's backyard, getting Cricket Australia to commit to using the red Dukes ball for half of each Sheffield Shield season up to 2019. This was no mean feat, considering the near-monopolistic situation in Australia: every state cricket association lists Kookaburra as a sponsor, and they fund more than 100 grass-roots associations in the country. "One of the reasons for changing to the Dukes ball was to give players exposure to the ball before the 2019 Ashes series in England," says a CA spokesperson. "It has also shown there is competition and different options in the cricket-ball market." A single white Dukes is also being used in England's 2nd XI List A competition from this season. "It shines up, holds its shine, it has a far bigger seam," says Anthony Botha, coach of Nottingham 2nd XI. "We haven't played any night games, but it generally does hold colour fairly well. The Dukes is a far better ball, but the reality is that it becomes a totally different game" - referring to how bowlers dominated the few matches played with the Dukes white. The ICC is also testing the Dukes white at the lower rungs of international cricket. "They have agreed to have my ball used in the World Cricket League," says Jajodia, "and it will be one ball for 50 overs." The red Dukes, meanwhile, featured in Pakistan's domestic cricket last season; an upcoming tour of England could have been the driving force. Global cricket dynamics change quickly when India wills it, so many eyes are on SG. The white SG ball was used in domestic limited-overs games in the 2017-18 season, for both the Syed Mushtaq Ali Trophy (T20) and the Vijay Hazare trophy (List A). While two new balls were used in the List A games, some players interviewed believed that a single white SG can last 50 overs. Most agreed that the white variant did not do as much as SG's red ball. The company confirmed they had received mixed feedback, and that trials would continue. "Kookaburra would return to senior domestic matches next season, but the SG ball would be trialled at junior levels," says BCCI GM of Cricket operations Saba Karim. Balls from other manufacturers are also tried in National Cricket Academy and Zonal Cricket Academy camps, although none apart from SG seem to have made it to the domestic circuit proper. For their part, Kookaburra plan to develop a new, more cost-effective white ball for T20Is, with a "more bulky seam that gives the bowlers something to work with" - although there are fewer questions about their ball in the T20 format. Kookaburra have also expanded operations to India, and set up a manufacturing presence there in partnership with SG. Even so, their current ubiquity might not be permanent. There are those who favour a change in Tests too. "The Dukes stays harder for longer, is more long-lasting, holds together better, keeps its shape and keeps its shine. I grew up with the Kookaburra ball in Australian conditions, but I feel the Dukes cricket ball is simply a better made cricket ball," says Gillespie. "The Dukes and the SG ball hold up very well. Kookaburra have gone through periods where their ball has held up well, but also gone through periods where the ball has been very below par. I can see why lawmakers and administrators are looking at alternatives." The 2017 season of MLB saw 6105 home runs. That is 412 more than the steroid-fuelled season of 2000. Amid fears that the ball was "juiced" - meaning that something in its construction contributed to more home runs - X-rays and analysis of core materials, even thermo-chemical tests, were privately conducted. Then in June this year, MLB bought Rawlings, the company that manufactures baseballs for them, giving them control over their product. Given the structure of international cricket, the ICC does not play as active a role in the development of cricket balls. Member boards therefore, particularly CA, have driven much of the innovation. But with all bilateral Tests and ODIs affecting an ICC outcome from 2020 onwards, there is a case for the governing body do more. As Kerry Packer proved, nothing drives living fossils to extinction or evolution better than competition backed by private funding. Cricket is a multibillion-dollar industry, and sooner or later someone will pour a fraction of that money into a lab that will develop and test every ball imaginable. They could come up with a white dye that does not discolour, or something more radical - a new raw material, say. After all, the laws of cricket only specify the size and weight of a ball, not that it be made of cork and leather. If that sounds far-fetched, consider how dramatically bats, pitches and formats have changed in the last two decades. Before the pink ball came along, the cricket ball had barely changed for more than 30 years. Perhaps it is catching up. Dukes v Kookaburra: One ball for all?